Now I’m ripping it down on Artfire.com too! 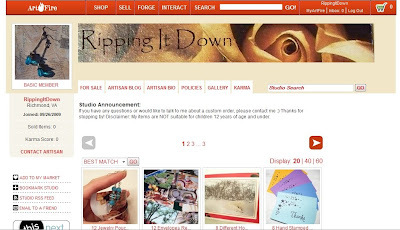 For the month of October, Artfire.com, another online arts and crafts marketplace, has been offering unlimited listings and some other features to their free account holders that are usually reserved only for their paid members. A while ago, I’d taken a look at Artfire and registered with them, as it’s always good to get additional exposure, but it didn’t seem worth the effort to list the small number of items that basic members are usually restricted to, especially since I hardly have time to list anything on Etsy these days. Then I came down with strep throat and was sick in bed for 3 days. Down but not out! I spent a lot of the time editing photos I had taken back when there was actually sunshine and free time, and listings those items on etsy and artfire. Thanks to the artfire deal, currently all of my jewelry there is a bit cheaper, and that price break should last through the holidays, so be sure to have a peak! I think this earring and necklace set is my favorite new item, although the image at the top of this post is probably my favorite new product photo! although this psychedlic photo of one of my mermaid bracelets is probably my favorite new product photo!